Nowadays, a number of casinos offer blackjack as it is one of the most-desired card games. It is played in various parts of the world and thus, it is no surprise that the game has a number of variations. One of the most popular versions is Multi-hand Blackjack due to its interesting gameplay. This game can be played in many brick and mortar casinos as well as online as it is one of the earliest versions that have emerged. The difference between the land-based game and its virtual counterpart is that online you can play this version at any time, whereas on a real blackjack table, it is possible to do so only if there are more seats available. This is the reason why the game is offered predominantly online. Multi-hand Blackjack also has its own versions whose rules can differ from one casino to another. The only difference between the classic blackjack and the Multi-hand game is that the latter gives you the opportunity to play more than one hand simultaneously. In most cases, you are allowed to operate up to five hands at once. All of the hands are separate and each one requires individual approach. Since they have to be treated independently, their outcome can be also different. For instance, if you have decided to play with four hands at once, it is possible to win three of them and lose one or vice versa. If a certain hand goes over twenty one, then it is excluded from the game and you continue playing with the rest of the hands. Usually, the betting limits each table has are slightly different than in the rest of the blackjack games. The reason why is that since the game is played with multiple hands, you will be required to place more bets and thus, the table minimums have been reduced for players’ convenience. In general, this version is perfect for active players who like to enhance their gaming experience even more by playing a more challenging game. In most games, it is allowed to double down on each hand which gives you even greater chances of increasing the amount of your wagers. However, on the other hand, by putting more wagers at once, you can finish your bankroll much faster if you lose. Moreover, when the game is played online, card counters won’t be able to apply their system with the same success as if they were in a brick and mortar casino. In fact, the whole process of card counting is impossible to be done online due to the virtual nature of the game. By playing more hands, you have the chance to place more bets and thus, make a bigger profit if you win. The basic rules of this variation remain the same as in the original game. You compete against a dealer and your main goal is to get a hand that is worth more than dealer’s, without going over twenty one. All of the cards are worth their numeric value, except for Queens, Kings and Jacks as they receive ten points. The Ace is also counted differently as it can be worth either one or eleven points. How the Ace will be counted is entirely up to you and you can switch its value as many times as you like. This online version is played with two packs of cards which are shuffled before the beginning of every game. At the beginning of the game you are required to decide with how many hands you will play. After that, you need to place a bet on each hand which doesn’t necessarily have to be the same amount. During the game you are also given the chance to increase or decrease your wagers, depending on your personal preferences. You play your hands from right to left and you are required to make a move for each one of them. In this version, you cannot surrender as this option is not available. You must choose whether to hit, stand, double down, take insurance or split if you have a pair. Your choice should be based on your first two cards as well as the up card of the dealer. When it comes to splitting and re-splitting, it is allowed to do so up to three times. The only exception is when you have a pair of Aces as they can be split only once. You are given the chance to double down on any two initial cards, unless they are an Ace and a 10-valued card which is blackjack. This is the highest winning combination you can get while playing. It is also possible to double down after splitting a pair. Insurance can be taken as usual when the dealer is showing an Ace. It has been calculated that the house edge of this version is approximately 0.39%. In this game, the dealer must stand when his total is seventeen or more, regardless whether his combination is soft or hard. If he has a total that is sixteen or less, then he is enforced by the rules to hit. The dealer is required to draw cards until he reaches a total that is at least seventeen. If he doesn’t go bust, then your hand and his hand are compared. 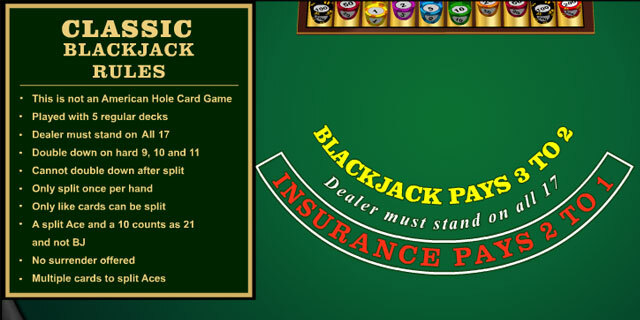 If you have a blackjack hand you will be paid 3/2 and if your insurance bet wins, the payout is 3/2. If you decide to give this exciting variation a try, then you should learn a proper strategy that you need to follow throughout the game. Without a reliable plan, you can lose four or five bets at once every time you play. In Multi-hand Blackjack, the gaming process can be very fast-paced and if you make your decisions impulsively, you might suffer severe consequences. However, if you have an efficient plan, you can increase your winnings greatly. Since all of the hands are played separately, you can try different strategies on each one of them. This way you have the chance to draw valuable conclusions and determine which strategy works best for you. If you happen to have a hand whose total is eleven, then it is advisable to double it down in any case, without taking into account the up card of the dealer. If you get a pair of Aces or 8’s, you should make the most of these situations by splitting them. However, in case that you have a pair of 5’s or 10’s, it is best to proceed differently. Instead, whenever you have a pair of 10’s, you should always stand. Whenever you have a pair of 5’s and the dealer shows nine, ten or eleven, you should hit and for the rest of the cases you should double down. When it comes to the insurance bet, in this version it is considered to be rather disadvantageous for you and thus, it is best to refrain from placing it. 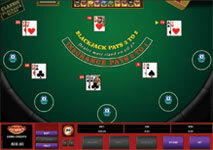 Multi-hand Blackjack is an exciting version which unlike many other casino games, besides luck it also requires skills. Proficient blackjack players advise that when playing this version, it is best to try different strategies for each hand. For instance, you can try playing one hand more aggressively and wager a bit more and for another one, you can have a more conservative approach. It should be noted that you are not required to handle five hands at once and you should always play with as many hands as you like.